ICANN President and Chief Executive Officer, Fadi Chehadé says he is prioritizing efforts to reach a resolution with domain name registrars in the on-going negotiations to achieve a Registrar Accreditation Agreement (RAA). The chief executive made the comments during a video interview at the close of the organization’s 45th public meeting in Toronto. 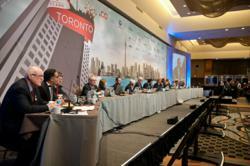 1,800 People from around the world registered for the meeting, making it the second largest in ICANN history. The meeting began only a few days after ICANN announced a plan to use a draw, or drawing, to determine which gTLD applications would be prioritized. This system would be used as a way to equitably schedule the release of initial evaluation results, pre-delegation testing, and contract execution.